Your average bus is not built to race. Your average bus is not built for speed. And your average bus is not built for comfort – not up front anyway. Your average bus is built to plod along at a moderate pace with a comfort threshold of an hour or so. In this respect our bus was perhaps slightly below average. But this bus wasn’t going to be slightly below average for much longer. We were going to raise the bar and make it average or maybe even a little bit above average. It was time for a step change. If we couldn’t literally make it go faster we were going to give it the impression that it looked like it could go faster. Bring on the Racing Seats. The driver and passenger seats were an uncomfortable ride, particularly the passenger seat, so I’m told. Not that I’ve sat in it. The problem is the springs needed adjusting and in places re-fitting. The horse hair pads were well beyond their use by date. That’s right, the seat padding is made of horse hair. Traditionally horse hair is the most comfortable thing to make padding out of. Which is why, presumably, it’s more comfortable to ride a horse bare back than with a saddle. Or maybe saddles are padded out with horse hair? I dunno, but I would have thought lamb wool or woolly mammoth fur or rabbit fluff would be a bit more comfortable, but what do I know. The seat covers also had splits in places and just looked a bit rough all round. 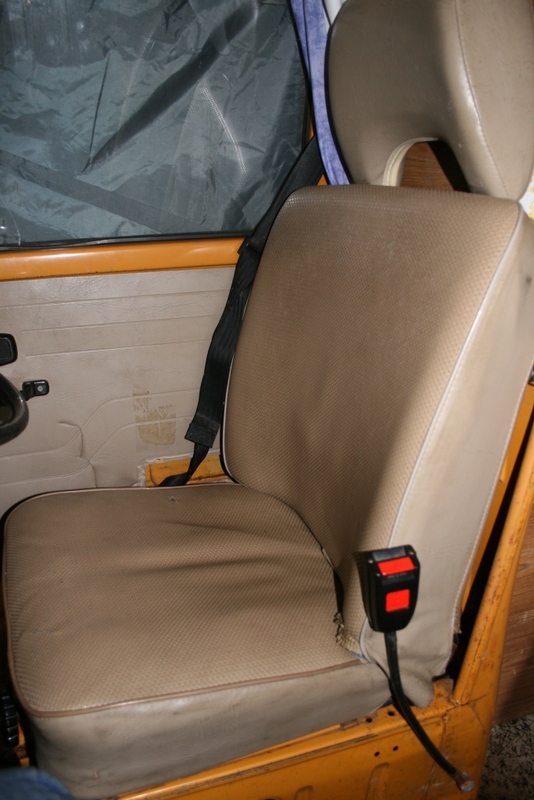 If the rear seats were great Skibbereen material then the front seats were the best skibbereens money could buy. The very thought gives you the shivers. We reckoned the front seats could really set the tempo for the whole bus and if we got the front seats right then the rest would look after itself. Seats come in different shapes and sizes. We’d seen one bus with bucket seats that looked really comfortable – unlike a real bucket, which isn’t. We’d seen some with headrests, some without, some with arm rests & some without, some that turned around (like on Start Trek) but most that faced the front and we did see one almost exactly like Jimmy Saville’s big red chair with a tea pot in the armrest (I made that up – we didn’t find one like that). The cleverest one we found was themed on the mastermind chair. I wanted, but couldn’t find, a bean bag seat. Now that would be great. Some come bench style, but that wouldn’t fit in our bus. Our bus is a walk through, which means you can ‘walk through’ from the front seats to the back without getting out of the bus. Clever! And if we ever decide to turn the bus into a real pay faring bus Sarah could check the punters’ tickets and then return to her seat up front dead easy. She could flog them cups of tea and home made cake too! And tell them stories or play Eye Spy (or is it I Spy?) or the best travelling game going, ‘Eddie’. Back to the seats – they don’t come cheap. Upwards of £500 each for a new retro designed seat. That sometimes confuses me – why we pay lots of money for retro stuff that really should be consigned to fashion history. We’re all mugs I tell you. So we went down the refurbishment route. Sarah ‘The Researcher’ did the researching and I did the agreeing. Sarah found a few websites that offered the refurb service, but after a few phone calls we decided on Paul Able Trim (http://www.abletrim.co.uk/engine/shop/category/Front+seats) based up in Chorley – where Sarah’s mum lives. Incidentally, Chorley is one of Sarah’s mum’s many nicknames……. On account of where she lives. Imagine if she lived in Goosecruives or The Devil’s Dyke. Deary me. Mr Able Trim is so called because he has the ability to trim. I think he does a sideline in hedges, haircuts and sheets of A1 maps folded and cut down to size. Paul Able Trim sent us some material samples so we could match up the colours we wanted. We then sent him some scaled 3D drawings I did in Sketch Up (get me) detailing the colours and dimensions. I measured the dimensions, so they wouldn’t be wrong. There are three cushions that make up the bed when it’s converted from the seats. And to complicate things all three are slightly different sizes. Paul Able Trim was only making the covers – we’d already bought the cushiony foam that goes inside. Paul Able Trim also threw in for free some of those arm rest things that look like sausage shape tubes. That was nice of him. Our theme for the seats has a certain ‘Herbie Goes Bananas’ about them. If memory serves me Herbie is white (memory not required for that) with a red and blue stripe running from front to back over the bonnet (hood), roof (roof) and boot (trunk). These stripes give the very real impression that Herbie can go fast. Why is this? Why do we see a stripe on a car and immediately think that means that car goes fast? I know we call them ‘go faster’ stripes but why? Beats me. Rather than plumping for red and blue, which even by my colour co-ordination skills I knew would clash with the mustard custard, which already has brown, cream, lime and purple incorporated into the bus. Instead we went for purple to match the curtain and pop-top purple, mustard to match the bus mustard and cream to match the, erm, curtain cream. With the colours chosen we took the seats out of the bus, packaged them up and couriered them off the Chorley. That’s Chorley the town, not Chorley the Mother-in-law. Paul Able Trim sent us photos of his progress which was somewhat slowed down by the delivery of new horse hair pads at his end. Or lack of delivery. Don’t ask how much a horse hair pad costs. I can’t remember exactly, but I did wonder if you got the horse, stable and groom with each pad. Eventually the seats and cushion covers arrived. Sometime around April 2010. Perhaps two months after we sent the old seats off. We weren’t in a hurry for them given the mustard custard was off the road, but it was well worth the wait. They looked splendid. Absolutely crackerjack. We kept them up in our loft room for a few weeks whilst the rest of the bus was stripped out, but occasionally, when Sarah wasn’t looking, I used to go up there and sit in the seat, like a saddo, thinking how brilliant they were and how fast the bus would go now. Simple things for simple minds. 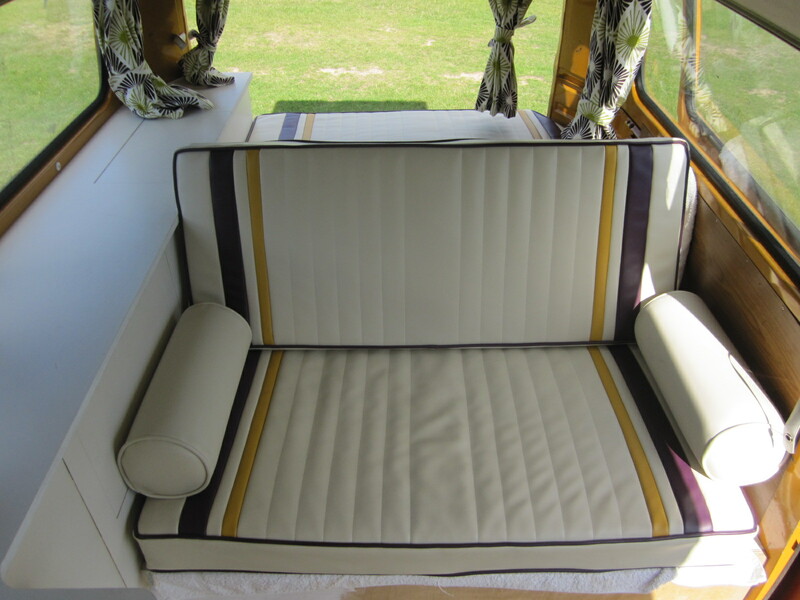 Paul Able Trim was really keen to have the stripes in the seat/bed cushions all line up when they were in situ in the bus. And they would because I’d done all the accurate measurements for him. Hang on, let me rephrase that. And they would if someone else had done all the accurate measurements for him. In the end they didn’t quite line up because the seat frame kind of squished one of the cushions over a bit. Hey ho. Whatever, you couldn’t deny the fact the bus now looked like it could go faster. And I mean real fast. Racing Fast. The travelling game ‘Eddie’. Its simple. If you see an Eddie Stobart truck then shout out ‘Eddie’ followed by the score. (e.g. One Nil to me, or if there are three of you playing it would be One Nil Nil to me). Don’t be surprised if after a while you find you’re the only one playing the game and the score is ’15 Eduardos to me and nil to you and nil points to you. Losers’. If you shout out Eddie and it isn’t then you lose a point. Mix it up by picking a different haulage carrier each. Norbert Desstrangle is a popular choice. I sometimes play this game when travelling on my own. 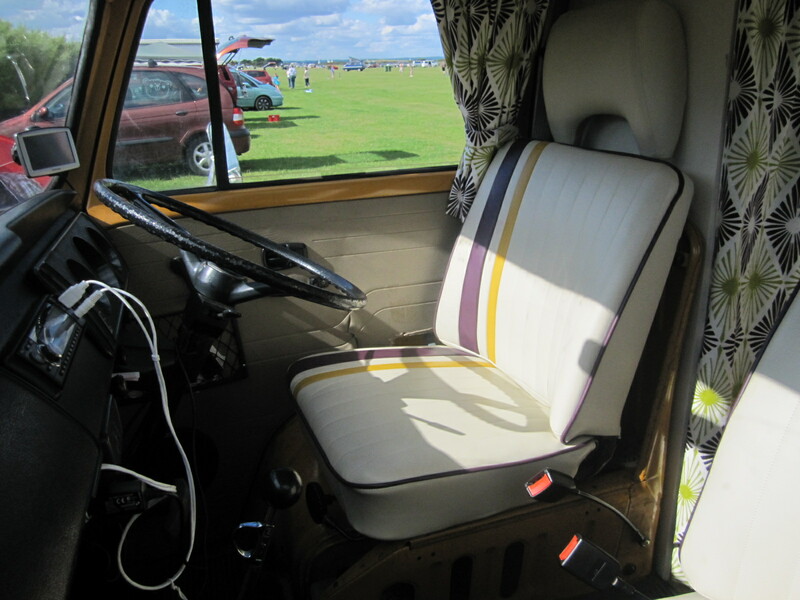 This entry was posted in The SapaBus Blog and tagged campervan refit, VW Bay, VW Campervan, VW Seats. I like our front seats but the rear bench needs a little working on. Thank you for your kind words, the wife will be pleased to know she has good colour tastes. You’re URL didn’t work by the way. Notty’s got a a real fridge ! I’m jealous now !